PAINTING AND DECOATING SPECIALIST. Est 1990. Colin Ewart Painting & Decorating Ltd is based in Glan Yr Afon Industrial Estate, Aberystwyth. 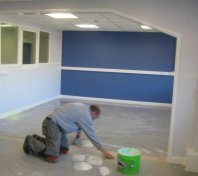 The business was established in 1990 to provide general painting services to commercial and public sector customers. In 1998 the business was expanded to provide general contractor services for refurbishment and new build schemes. In 2004 the business expanded further to provide retail and trade sales of paints, accessories and consumables through its outlet store Ace Decorating Suppliers. Colin Ewart Painting and Decorating Ltd is currently in the process of achieving Investors In People (IIP) accreditation.